The Climate Institute is using the services of a nine year old actor, Jack Versace, to raise awareness of their agenda in the Australian 2007 federal elections. 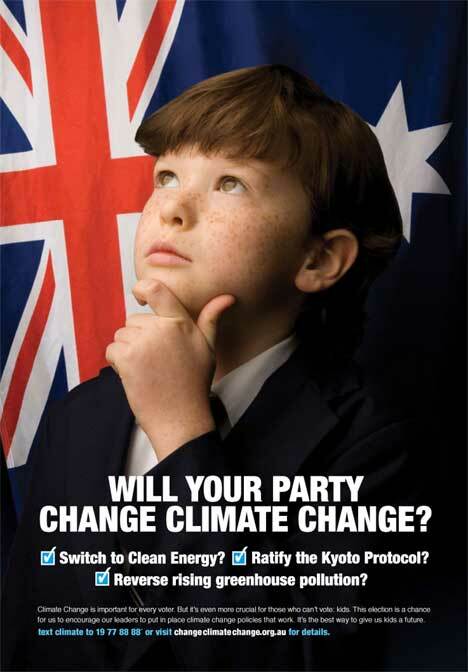 Acting as Jack Simmons, the boy appears in print and television advertisements on behalf of the Future Party encouraging voters to think carefully about the parties’ policies on climate change. See more at the Climate Institute YouTube channel. Established in late 2005, The Climate Institute has a five-year goal of raising public awareness and debate about the dangers to Australia of global warming and to motivate the country to take positive action. The Climate Institute is funded by a donation from the Poola Foundation (Tom Kantor Fund). The Climate Change election campaign was developed at Love Communications Sydney by executive creative director Simon Reynolds, creative director Scot Waterhouse, art director Andrew Leftley, copywriter Guy Lemberg and agency producer Paul Johnston. Filming was shot by Ben Lawrence via Caravan Pictures with producer Emma Lawrence.